I am starting the 2015 Artist Spotlight Series with a boom. In early December, I was afforded an opportunity of a lifetime. 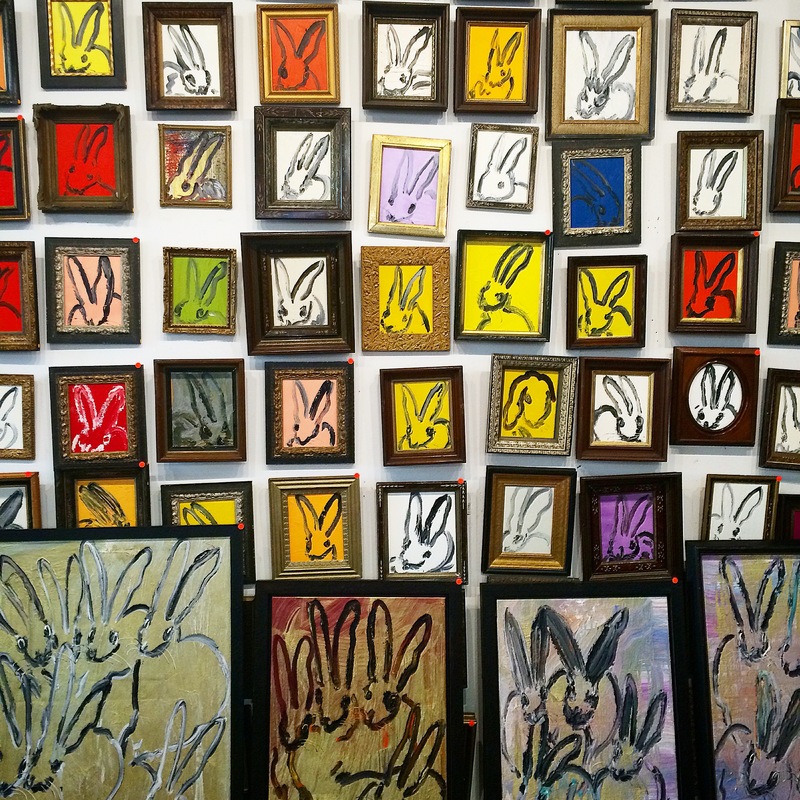 A Hunt Slonem studio visit has long been on my bucket list. Luckily, it happened for me the day after the Kravet fabric launch party in New York. I walked into an unassuming warehouse to be transported into a magical place that I will never fully be able to explain. The studio is just massive and filled to the brim with art, art, art and more art. There is are sculptures, orchids, furniture, glass everywhere. You then hear a squawking “hello” and see a central area deep in the studio where dozens of large birds wander in their huge cages and some freely in their immaculate habitats. It is surreal and breathtaking all at once. Stendhal syndrome may be the perfect definition of how I felt among such greatness. Enjoy getting to know this legendary artist. I was blessed to spend an hour with him in the studio. After completing school, which included living in Nicaragua as an exchange student when he was 16 years old, Slonem commenced undergraduate studies at Vanderbilt University in Nashville, Tennessee. “He’s drawn to the exotic birds, butterflies, and swamplands of the American South. “I would say my whole life could be summed up by the word ‘exotica, ‘” says Slonem, who owns two magnificent antebellum homes in the South and an aviary with some 30 parrots, some doves, and various macaws and cockatoos. Slonem’s birds are the stars of his dreamy, crosshatched, nearly abstract canvases.” via a wonderful Interview magazine article. Mr. Slonem does not have a favorite piece per se but pieces from each period that remind him of the times in which he painted them. He has moved his studio 5 times, . This massive studio has been his for 4 years and another move is on the horizon for Spring. He is more influenced by his inspiration such as “exotica” and his fascination with certain themes such as Abraham Lincoln. Mr Slonem told me fascinating stories of the séances that were held in White House by Mary Todd Lincoln, who was very spiritual yet not religious. She also was said to have foreseen his death with her psychic abilities. Read all about it in the book mentioned below. Slonem is a Diet Coke connoisseur. Mr. Slonem works on the balance as we all do. He has been seeing someone for the past 8 years. Hunt has had the pleasure of traveling the world many times over. He would love to go back to a few of the places that continue to inspire them. These places include India, Philippines Bird Market, Hong Kong to name a few. Slonem is more interested in longevity in the art world vs. a specific commission. So many great were lost too early such as Haring and Basquiat. He has been painting and a working artist for his entire life. His grandfather also painted while his father was an engineer in the military building Submarines. Painting is in his innate makeup and he is amazingly prolific. He produces over 20 original works on an average day in his studio. Hunt does not have one possession but collections of many things that fill his many homes with gothic chairs, Belter furniture, Blenko glass. As a cancer he is very attached to his homes, places and the history of collecting, tropic places such as Belize. and also the great Maria Callus. Hunt has a few vision issues that keep him off the computer for the most part. Enjoy a walk throughout the studio with me. The large warehouse behind this drive through McDonalds (yes in NYC) is the studio. the entry to the massive studio…. stacks of books and paintings…. HUGE painting of The historic Rexmere Hotel that Hunt Slonem was in he process of purchasing when it burned to the ground. Read the article HERE. It was a great loss for him. humongous is not an exaggeration!!!!! the Abraham Lincoln mystical connection to Hunt is fascinating…. and my Diamond Dust Bunny painting. 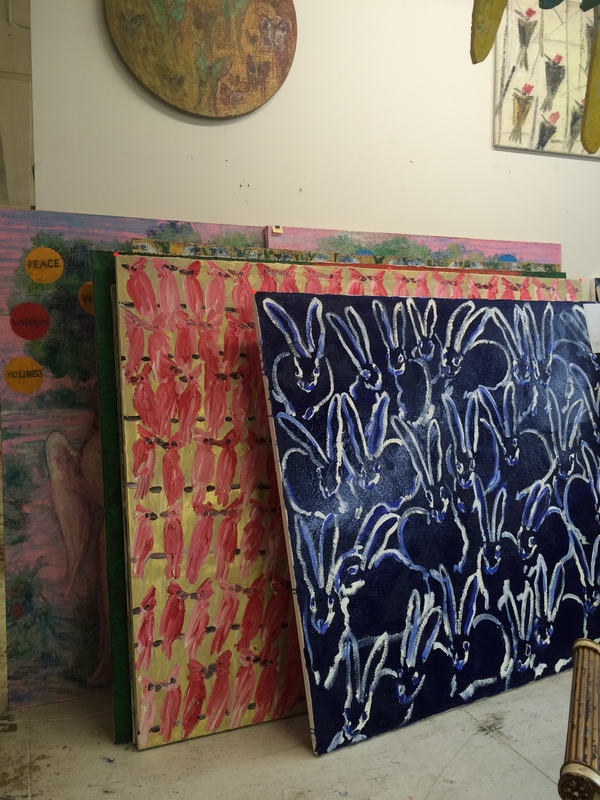 Thank you so much for sharing your visit Hunt Slonem’s enchanting studio. I drooled all over my keyboard. I’m so jealous of your visit.